Organize the kitchen without spending a ton of money by using these Dollar Tree organization hacks! 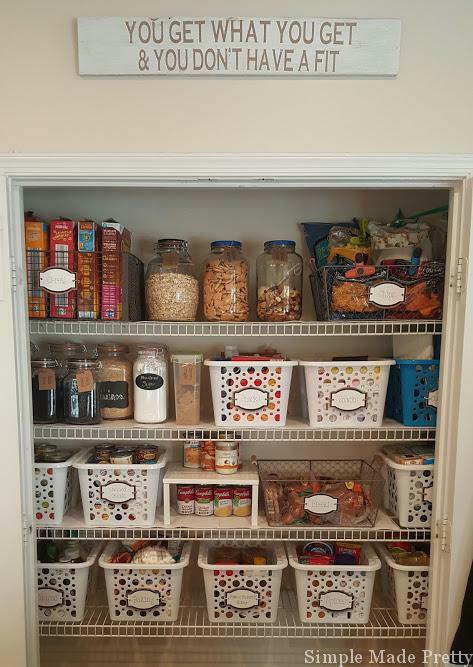 I love finding useful Dollar Tree kitchen ideas and ways to use Dollar Tree items in my pantry. 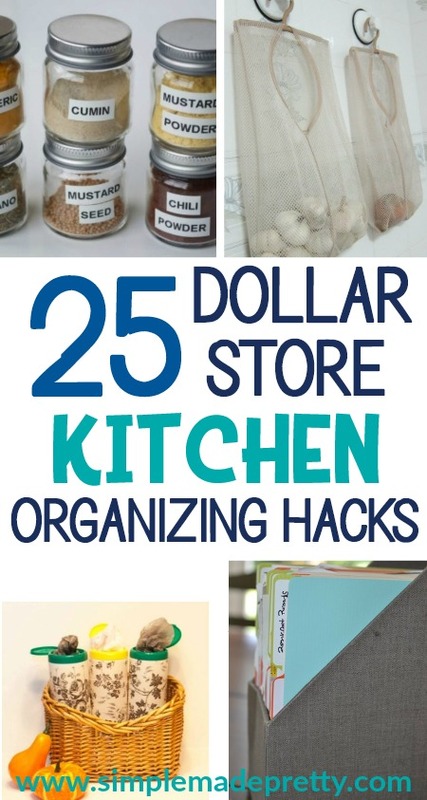 You can also use Dollar Tree fridge hacks by using Dollar Tree bins in every space in your kitchen! Keep reading to see these Genius Dollar Tree Kitchen Organizing Hacks! 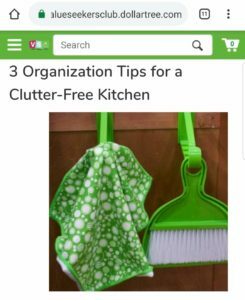 If you’re looking for Dollar Tree kitchen organization, look no further! The Dollar Tree kitchen items mentioned in this post are available to order online if you can’t find them at your local Dollar Tree. 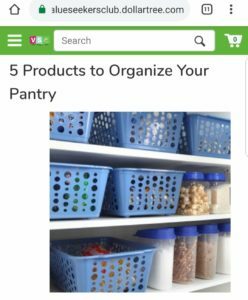 Dollar Store organizing is not something new, in fact, I’ve been using the same Dollar Store organizing kitchen bins to organize our kitchen pantry for the past 6 years! 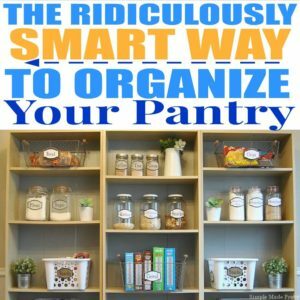 Everyone always asks how I used the Dollar Store to organize out pantry… well, you can see how to organize your Pantry using Dollar Store bins and containers in this post! I’m waiting for my local Dollar Tree to get some handle baskets back in stock so I can organize our fridge using Dollar Store items too! 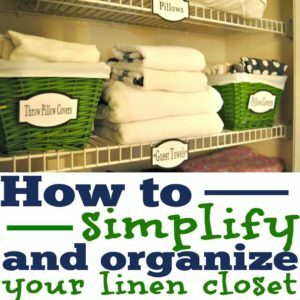 I use Dollar Store items for organizing and under the sink, I’ve helped others use Dollar Store items to organize kitchen pantries, and organizing inside cabinets using Dollar Store finds! 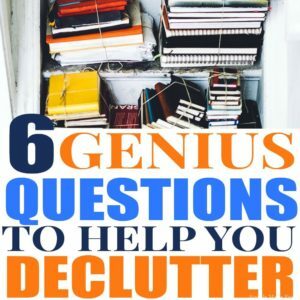 Please note that I follow the Marie Kondo “spark joy” method to organize our home. I’ve been using the Marie Kondo Organizing method since 2016 and it has changed our lives. 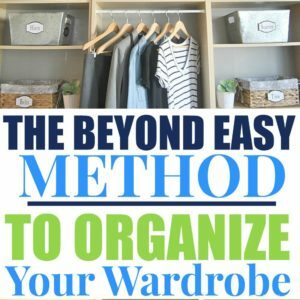 I use the Marie Kondo folding technique and believe the Dollar Tree organizing items on this list work well with the Kon Marie method. Of course, not every household is the same and what sparks joy for you using the Kon Marie spark joy method, may not spark joy for someone else. 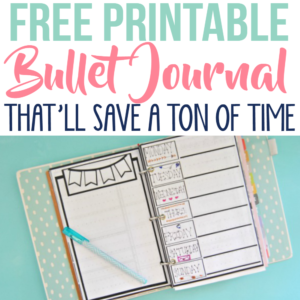 –>>Get organized in 30 days with this printable calendar! 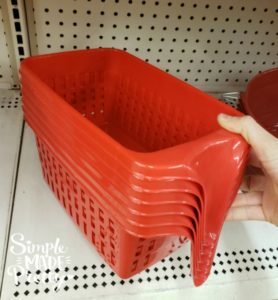 The Dollar Tree has several plastic baskets in various sizes and colors that can be used to organize every inch on your kitchen! 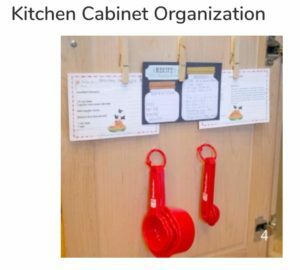 Here are a few ways I’ve used Dollar Tree baskets and bins to organize our Kitchen. As I mentioned above, I use Dollar Tree baskets to organize our kitchen pantry. I love the size, color, and sturdiness of these baskets. These Dollar Tree baskets survived our move from Virginia to Florida and the printable pantry labels attached to the baskets with twine. 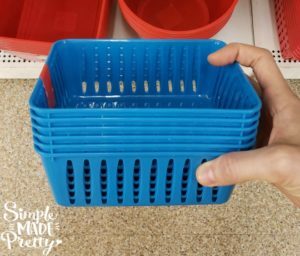 The Dollar Tree has several baskets with handles (including clear trays/baskets) that work great in the fridge to organize meals or small items together. –>>See more Dollar Tree baskets to organize your fridge! 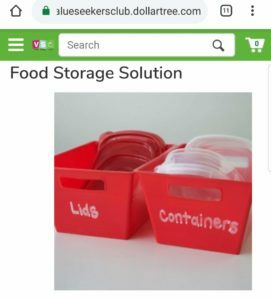 I use Dollar Tree bins to organize the lids for food containers, lunch containers, and small Tupperware items. Add a label and you’re done! 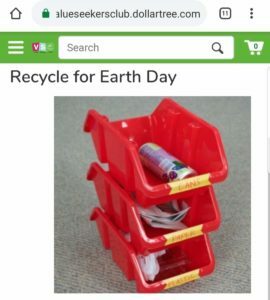 You can create a recylcling station by using Dollar Tree bins and adding a label. How convienent would this be under the sink in the kitchen?! 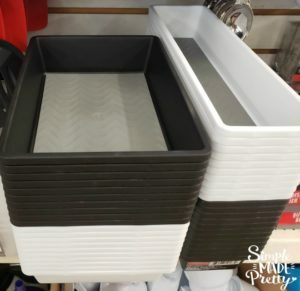 The Dollar Tree has several food containers that you can use to store dry goods, meal prep items, and more! Organize dry food (cereal, crackers, flour, etc) in Dollar Tree containers! 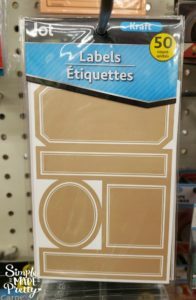 The Dollar Tree has all sorts of labels… you just need to look for them because they can be small! 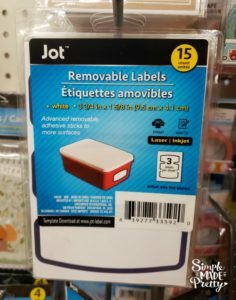 I found a few labels at the Dollar Tree that can be used all over your kitchen. Some of the labels I found at the Dollar Store are even removable! Check the office supply aisle or buy through the link below! Easily label Dollar Tree baskets (like I use in our pantry) with these removable dry erase labels! Use these labels on meal prep items and snacks for easy grab and go! This set of 6 baskets for $1 is the perfect way to quickly clean up the junk drawer! Get utensils and other large kitchen spatulas, etc clutter-free by using a drawer organizer in your kitchen. 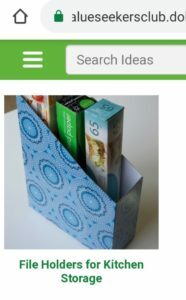 Use Dollar Tree binder to organize recipes and meal planning in the kitchen! Grab a Dollar Tree binder and binder tabs to make your own meal planning binder! I love how Green Way Home set her recipe file folder up! 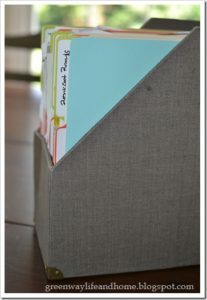 Stick your meal planning binder, along with your recipes in a file folder on your kitchen countertop for easy access! 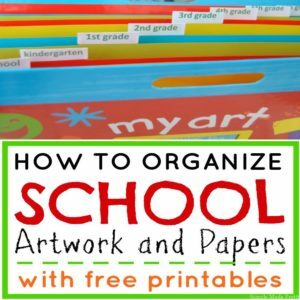 Use a File folder box to organize foil, plastic wrap, sandwich bags, etc. 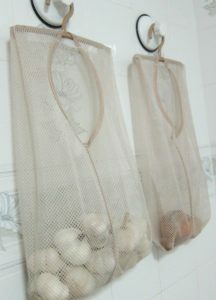 Hang onions, potatoes, and garlic in a cool dark place by using a mesh laundry bag from the Dollar Tree and hang in your pantry! Check out how One Crazy House uses mesh laundry bags in their home! Use Dollar Tree hooks to hang aprons, potholder, kitchen towls, and more! Make baking easy with access to measuring cups, spoons, and recipes by attaching Dollar Tree hooks on the back of cabinet doors. Keep cleaning supplies handy under the kitchen sink by using this Dollar Tree kitchen hack! The Boat Galley used 3 colanders from the Dollar Tree and a large mesh laundry bag to protect the fruit and veggies in her kitchen. This idea is genius! The Dollar Tree has several glass jars in various sizes to use depending on your needs in your kitchen. Small spice jars from the Dollar Tree can help you organize your spices and create a pretty kitchen! 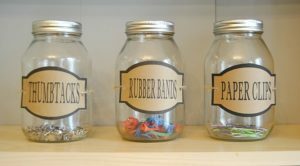 Organize smaller items in the kitchen using Dollar Tree’s version of glass mason jars. I like using Glass mason jars to store meal prepped food for the week in the fridge, like salads, fruit, and more! 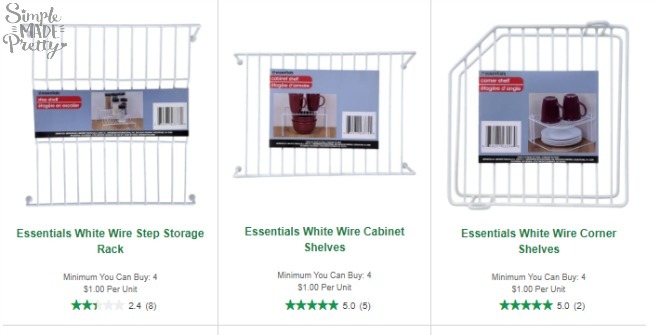 The Dollar Tree has several wire shelving units to help increase your shelf space! Add these small wire shelves in yoru kitchen cabinets to organize and hold small bottles and spices! 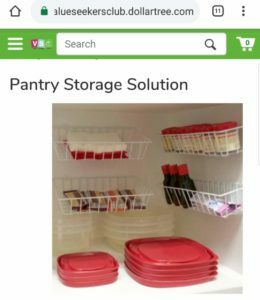 The Dollar Tree has several wire shelves that you can use in your pantry or cabinets to create extra space for dishes, cups, and more! 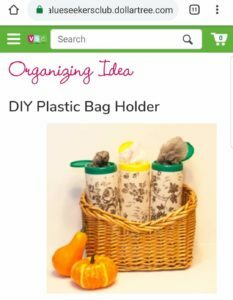 I love this Dollar Tree kitchen hack using an old wipes container to store plastic grocery bags! Keep on eof these by the recycling station or in your pantry for handy use! 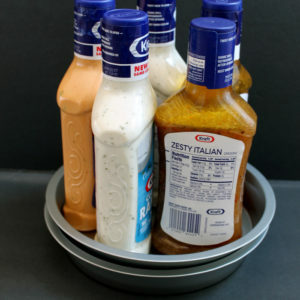 Make your own DIY lazy Susan using Dollar Tree items from the Country Cottage Chic! Use this lazy susan in your pantry or fridge to hold small items and corral like items together. I hope these Dollar Tree organization tips inspired you to get your kitchen organization cheap! Organize Kitchen Cabinets quickly and on a budget by using these Dollar Tree ideas. 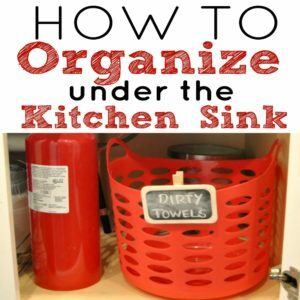 The Dollar Tree pantry, Dollar Tree fridge, and Dollar Tree bins under sink hacks will make the most impact on your kitchen organization. 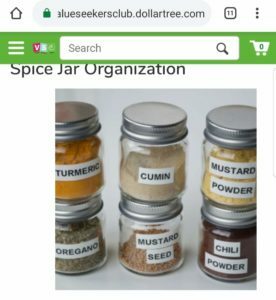 Organize Kitchen using the containers, spices organization ideas, while keeping your kitchen organization on a budget by following these Dollar Tree organization hacks! Need some help with Meal Prep and not sure which meal prep tools will help with meal planning? 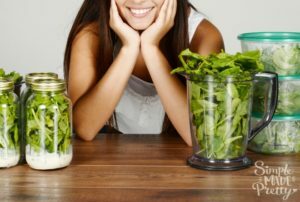 Meal planning on a budget can be tough and finding the right meal prep supplies and meal prep containers can add up. 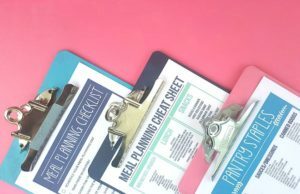 Knowing where to find meal planning tools and meal planning ideas will help make family meal planning easier. 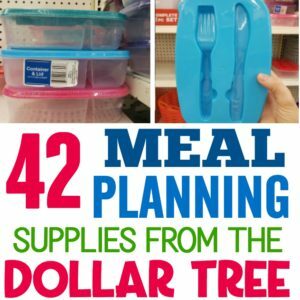 Keep reading to see these 42 Meal Prep Tools From The Dollar Tree Meal! Meal prep for the week using these Dollar Store finds and Dollar Tree meal prep tools! The Dollar Tree even has supplies so you can make your own Meal Planning Binder and meal planning menu board! These Dollar Store meal planning tips will blow you away! 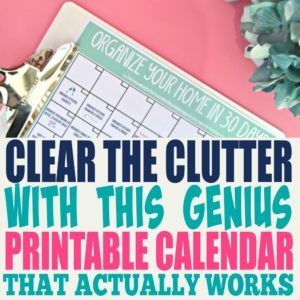 32 Home Management Printables that REALLY Work! –>>Go here to get your copy of the Homemaking Printable Pack today! Are you ready to be more productive? Get 46 eBooks, eCourses, and printables on conquering your to-do list, reaching your goals, and freeing up more time with the Ultimate Productivity Bundle. Life’s too short to waste! Why not learn how to streamline your routines and use productivity tools to your advantage – all so you can free up the time to do more of what you love? That’s exactly what the Ultimate Productivity Bundle is all about: 46 eBooks, eCourses, and printables to find more margin, reach your goals, and rock your to-do list. 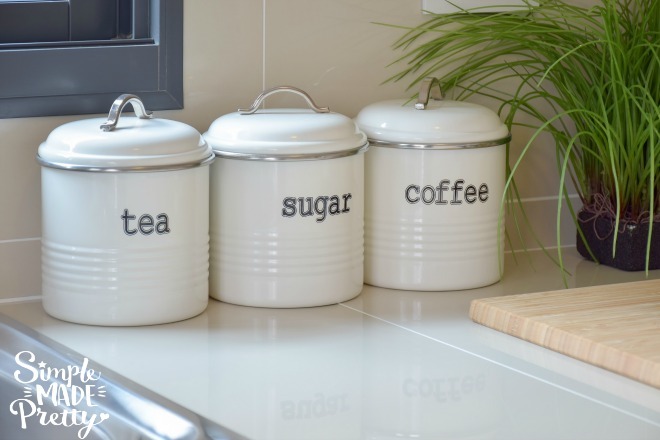 Organize Your Kitchen in 3 Days! A cluttered Kitchen can cause anxiety, stress, decreased productivity, and procrastination. This eBook walks you through organizing your kitchen in 3 days. Printable Pantry Labels (as seen here) –>>Includes 45 labels for the kitchen pantry. 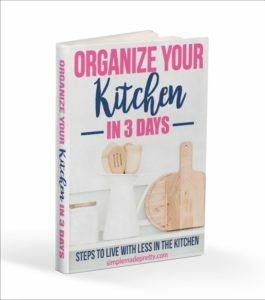 –>>Get the Organize Your Kitchen in 3 Days eBook here!